All through the 77-day Siege of Khe Sanh we learned how to live with less of everything except ammo and conflict. It was one of those exercises in finding out how little you could live with and how much you could live without. What we had a lot of was death and fear, two things linked by chains that the mind manufactured. For some of us, even though we escaped death and maiming, we were wrecked by the accumulative effects of fear. One of the things we didn’t get enough of was chow. Our major source of nutrition, C-rations, for me at least, were always the meal of last resort. If I could get A-rations (hot chow in the mess hall) or B-rations (hot chow delivered out into the field)), I’d take them over C-rations anytime (we received neither A or B-rations during the Siege.) But even our C-ration allotments were cut down from three meals to two per day, and sometimes even less, to one-and-one-half, or even one. What was left of the post office at Khe Sanh where our packages from home might show up some time. A lot of us got care packages from home loaded with things we loved to eat . . . chocolate chip cookies and carrot cake and other stuff, jerky, salami . 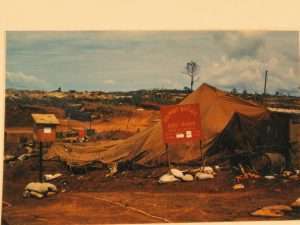 . . but the perilous nature of flights into Khe Sanh made delivery an iffy deal and when packages came, they had often been in storage so long that everything would be moldy or crushed or rifled through by someone in the battalion rear at Phu Bai. So it was of some interest to me when the platoon commander ordered me to lead a patrol, after dark, down to the battalion supply depot to procure some extra rations for all of us. Procurement is an ancient and accepted activity in the military and is really nothing more than a form of theft, robbing from Peter to pay Paul, so to speak. The reality was, we were hungry, losing bulk, and someone out there had what we needed. Down at the supply dump it was damned important for them to hang onto whatever it was they husbanded, but our needs, in our minds, trumped their duty. So we set out after dark. Six of us. We sneaked down the trench and out the back of our lines as the mist hung like a curtain. We crossed a flat area devoid of structures, then past a few bunkers where, if you got close, you heard men talking in low tones. We came into the supply dump from the back, climbed under a half-assed fence and turned to on mounds of supplies that were covered with big tarps. We found a lot of stuff we weren’t looking for, but eventually we found cases of #10 cans of sliced pears and sliced peaches and grapefruit juice. A couple of the men picked up as many cases as they could carry while still keeping ahold of their M-16s. We discovered stacks of C-ration cases and loaded up with those, too. We struggled with our burdens as we tried to sneak back out without making a lot of racket. We dropped our loads and for what seemed like an eternity we stood there, him pointing his rifle at us, us pointing our weapons—our M-16s and M1911A .45 caliber pistols—back. It’s funny how you can panic at the littlest stuff. I thought, for a moment, about dropping my loot and threatening to light him up. Then I thought better of it, and then I didn’t know what to do. Someone from my side took over, started rapping about Ohio—because he’d recognized the accent of the guard’s speech—and how they were both home boys, what my man missed about the Midwest: young women, summer nights, high school football. Somehow, my Marine talked him into letting us go with the loot. An exchange of Military Payment Certificates greased the squeaky wheel and we sneaked back to our platoon command post where the lieutenant took all of the #10 cans of fruit, all the grapefruit juice, and most of the C-rations. When we got back to our squad area and opened the C-ration cases, we discovered those particular meals were manufactured during the Korean War. They were old and tasted like it. We never saw any of the fruit or fruit juice.